37.3 % of Winnipeg tenant-occupied households spent over 30% of their income on housing. 11.6 % of Winnipeg owner-occupied households spend over 30% of their income on housing. 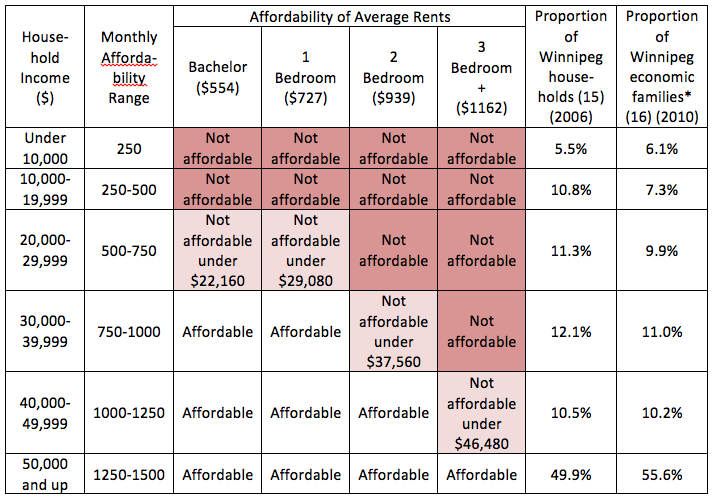 Affordable rents are established by Manitoba Housing. 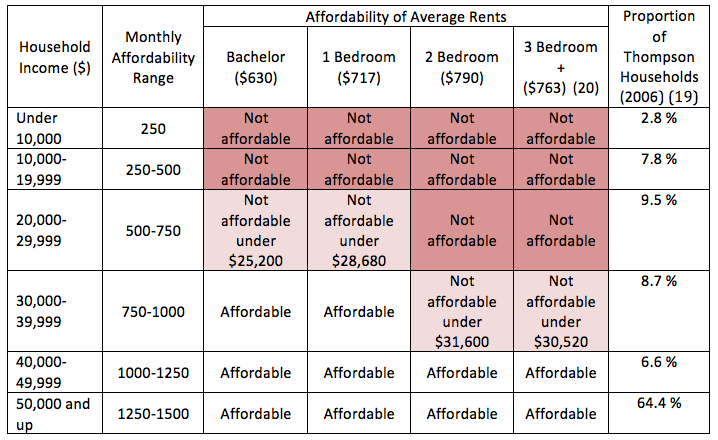 This table compares the affordability of current rents with incomes. 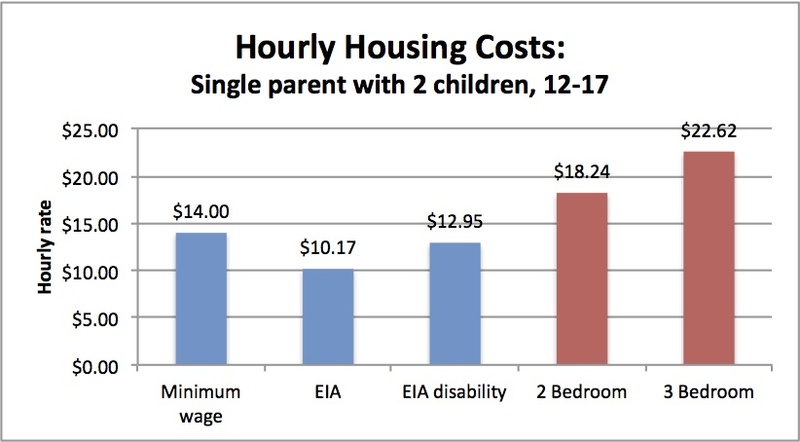 Economic families may include single people who reduce their housing costs by living with roommates or others; households include all members. The dates for income and rent data are different, but rents have been rising much quicker than incomes. * Includes economic families (two or more people living in the same dwelling who are related by blood, marriage, common law or adoption) and unattached individuals (people living alone or with others to whom they are not related). EIA rent allowances are based on the size of the household, rather than the size of the rental unit. This table approximates how many people could live in various apartment sizes. These charts show how much a household must earn per hour to afford an average rental unit in Manitoba (based on a 40-hour work week, 50 weeks of the year). The blue bars show the hourly minimum wage, EIA and EIA disability benefits (these include RentAid and federal benefits such as the Canada Child Tax Benefit, etc., where applicable. Housing benefits that only some households are eligible for, such as the Portable Shelter Benefit, are not included). 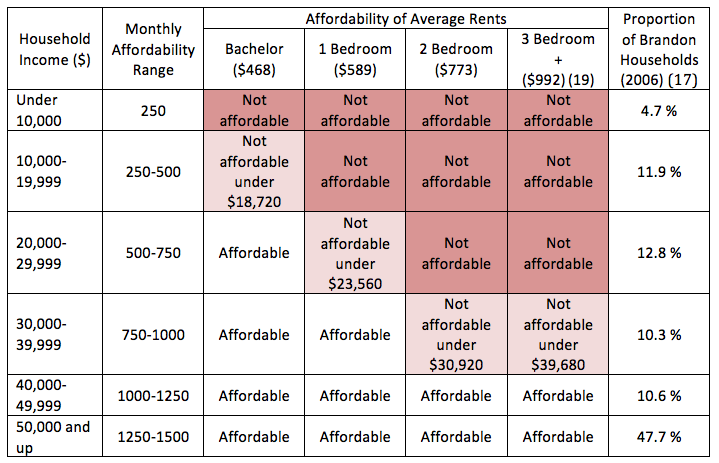 The red bars show how much a household must earn per hour for the average rent to be affordable, based on the 30 percent of household income affordability benchmark. For example, an average 1-bedroom unit in Manitoba costs $718 per month. 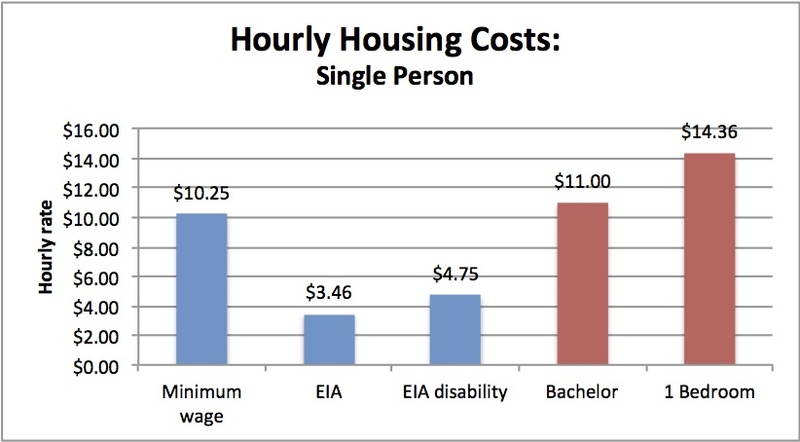 For this to be affordable, a household must bring in $14.36 per hour. 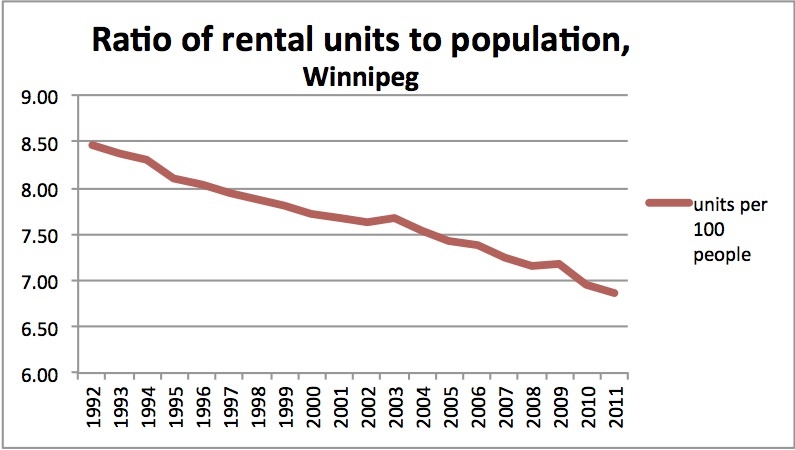 Since 1992, Winnipeg’s rental universe has declined from 57,279 units to 52,569 in 2012, (29) a decline of about 8 percent. At the same time, the population of Winnipeg has increased from 677,000 to 762,800, (30) an increase of about 13 percent. The result is a drop in the number of rental units from 8.5 units to 6.9 units per 100 people. 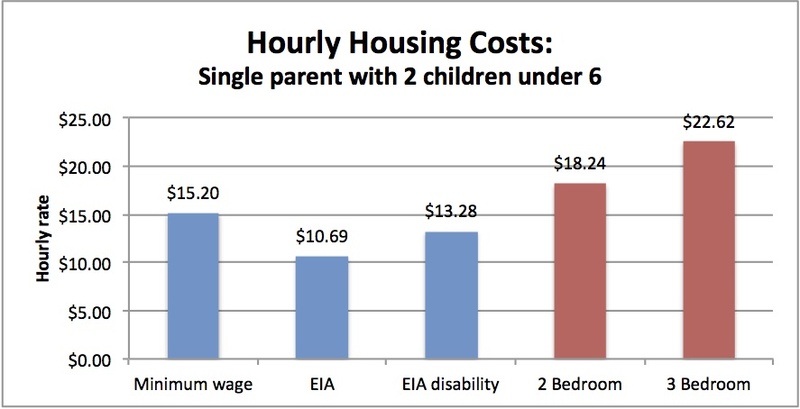 Affordable housing: Housing that costs 30 percent or less of household income. Usually refers to housing below median rent/price; does not necessarily have any restriction on household income. Lower end of market housing: Social housing where rents are equivalent to rents for comparable units at the lower end of the private market for households that would have difficulty affording housing in the private market. Some homeownership programs focus on this area. 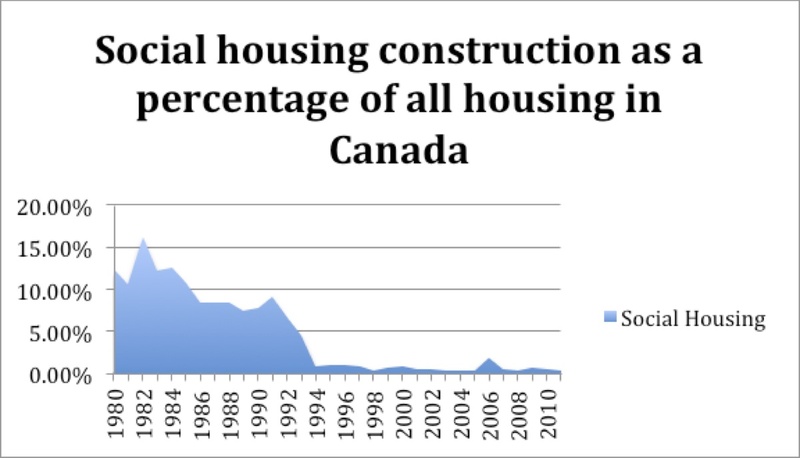 Public housing: housing that is owned by Manitoba Housing and rented at a subsidized rate, for households with limited or fixed incomes. 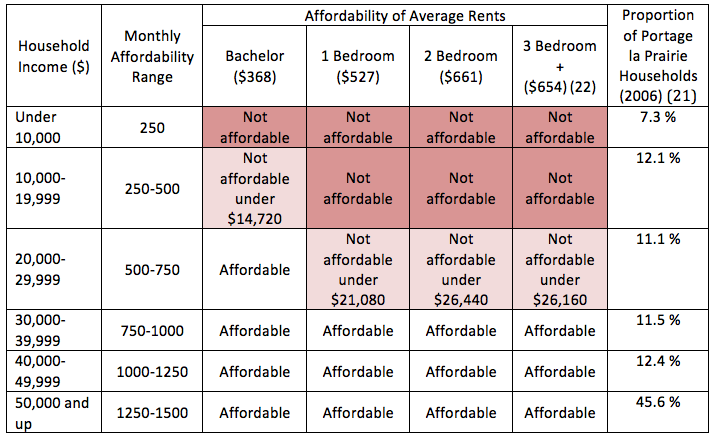 Rent geared to income housing: Housing where the rent charged is set at a proportion of household income (usually 25-30 percent) for households with limited or fixed incomes. 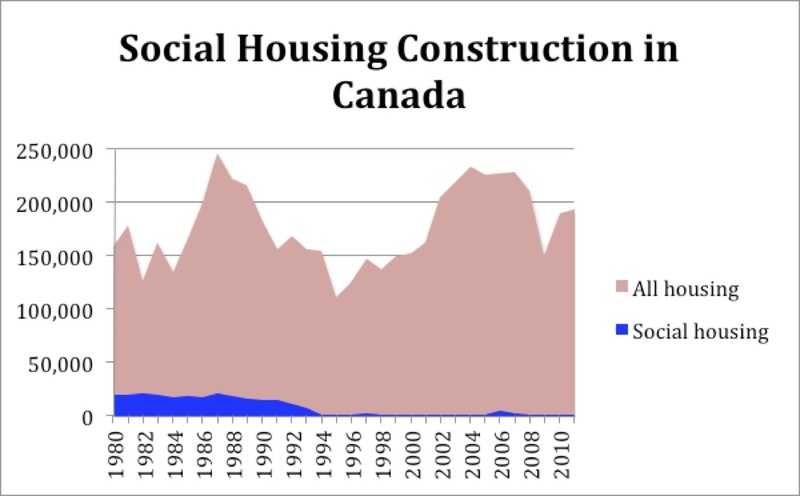 Social housing: A broader term that includes housing owned by Manitoba Housing as well as housing owned by non-profit organizations, that is rented at a subsidized rate for households with limited or fixed incomes. (1) CMHC. 2009. Canadian Housing Observer. Also offers data on types of family, Aboriginal status, and period of immigration. (5) CA – Census Agglomeration. Much like a CMA, but at a smaller scale. (29) CMHC. 2011. Personal communication from Dianne Himbeault; CMHC 2012. Rental Market Report: Winnipeg CMA. (36) CMHC. 2011. Canadian Housing Observer.